Extant Cariamidae (seriemas) include two predominantly carnivorous species, which occur in semiopen, dry habitats of South America. 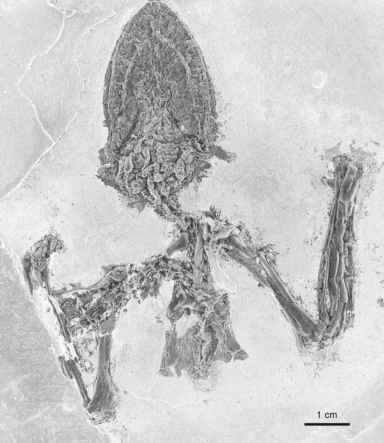 Their classification into the "Gruiformes" by earlier authors has never been convincingly established, and molecular data congruently suggest a position of seriemas within a clade, which also includes the Strigiformes, "Falconiformes," Psittaciformes, and "higher land birds" (see Chap. 3). Paleogene stem group representatives of the Cariamidae were very diversified and widely distributed over Europe and the Americas. These birds are usually united in the taxon Cariamae and include medium-sized to large, often cursorial species. They typically exhibit supraorbital processes on the skull, a short carpometacarpus with a wide intermetacarpal space, and a distinct, ventrally directed tubercle on the proximal end of the bowed minor metacarpal, as well as a block-like hypotarsus which does not enclose bony canals. Not all of these features are, however, present in every taxon included in this chapter, and some birds are discussed here only because they share a similar overall morphology with unambiguous Cariamae. Even if only those groups are considered whose close relationship to extant Cariamidae is well established, i.e., the Phorusrhacidae, Idiornithidae, and Bathornithidae, the historical biogeography of the Cariamae is not easily understood. These birds occurred in the Paleogene of South America, Europe, and North America. The most obvious hypothesis certainly is a dispersal from South America (Phorusrhacidae) to Europe (Idiornithidae) via North America (Bathornithidae), or vice versa (Mourer-Chauvire 1999b). As yet, however, no North American Cariamae are known before the late Eocene, whereas representatives of this taxon were already very diversified in the early Eocene of Europe and South America (see Sect. 17.2.1 concerning the similar distribution of Paleogene ratites).